The E (eco) lifter range is the perfect cost effective solution to the simple lifting applications. All spindle driven so no belts or chains. Available with a 90KG capacity and low enough to fit through a standard 2000mm doorway. We can also customise the mast to be shorter if required. If you need to achieve a higher lift heigh please see the modular range (P). The eco lift is available in stainless or powder coat steel finish. It comes with a standard nylon platform W498mm x 440mm. 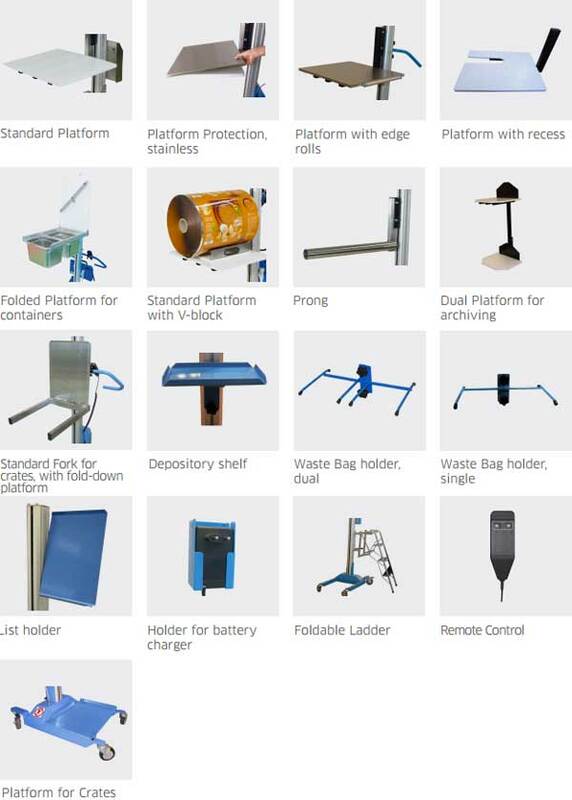 Custom platforms and lifting attachments are available. Battery life is excellent. Lifting a full load from the bottom of the mast to the top….then back again qualifies as one full lift. 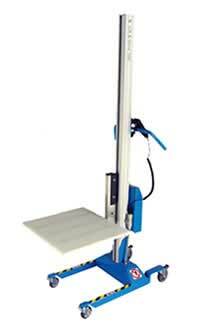 An eco lift will do approximately 100 full lifts on a single charge. The charger has an auto cut-off so you can leave it on charge overnight. The charger requires a standard 3 pin 240 Volt domestic supply. On four swivel castors (with two rear foot operated brakes), the eco lift is strong and lightweight due to it’s aluminum construction. The handles and remote are height adjustable to best suit the operator and a full range of accessories are available. Clipboards, stop switches, motor brake, two-speed remote control, quick change battery pack for 24/7 operations etc. The eco lifts are built to the highest standards in Sweden and require little maintenance. We have a full range of spares in stock in the unlikely event you need something. The most common spare we sell is a replacement charger as customers sometimes lose these in large organisations!